Charlie Baker, Larry Hogan and Phil Scott should get T-shirts made up. In the first quarter of 2018, according to Morning Consult, they were the first-, second- and fourth-most-popular governors in America.1 And that’s despite sharing one surprising commonality: They are Republicans in three of the country’s bluest states. If they were a band, they’d be called Maroon Three — red castaways enisled in a sea of blue. This week, Morning Consult released their updated ranking of America’s most popular governors, and, like last quarter again, Baker and Hogan topped the list. A full 69 percent of voters in Massachusetts — whose FiveThirtyEight partisan lean2 is 24 points more Democratic-leaning than the nation at large — approved of the job Baker was doing, while only 17 percent disapproved. The story was almost exactly the same in Maryland, another D+24 state: Hogan received a 68 percent approval rating and a 17 percent disapproval rating. But Scott might get voted off the island. While he had a 65-21 approval-disapproval rating among Vermonters in the first quarter, he has fallen to 47 percent approval, 42 percent disapproval in this week’s findings, tarnishing his both-sides-of-the-street cred. The likeliest reason for the plummet in his popularity is a landmark gun-control law he signed in April amid protests in this historically gun-friendly state. The new numbers cast doubt on the widely held assumption that Scott will cruise to re-election in 2018. But if he is indeed in danger, it may be in the Aug. 14 GOP primary rather than the general election. That’s because his popularity has eroded dramatically among Vermont’s Republicans, dropping by 26 points since last quarter. According to Morning Consult, Scott amazingly now has a higher approval rating among Democrats (who approve of him 61 percent to 31 percent) than Republicans (who disapprove 56 percent to 41 percent). If he survives his primary challenge from a pro-gun business owner, Scott still starts in a good position to win the votes of the state’s many Democrats. And he’s not alone in his cross-party appeal. Baker is about equally popular among Democrats (who approve of him 70 percent to 17 percent) and Republicans (who approve 69 percent to 20 percent). Hogan can’t boast the same, but I imagine he’s still pretty happy with his support across the political spectrum: 62 percent of Democrats approve of his performance vs. 23 percent who disapprove. Republicans approve of him 82 percent to 10 percent. Those numbers sound impressive — and they are — but they’re not as unusual as you might think. Support for governors frequently defies partisanship, at least if you define “partisanship” by people’s presidential preferences. Gubernatorial elections have gotten more nationalized in recent decades, but many voters still see state and federal elections as fundamentally different ballgames. There is basically no correlation between each governor’s net approval rating3 in the latest Morning Consult poll and his or her state’s partisan lean. Some governors are right in line with the partisanship of their states, such as Democratic Gov. Jay Inslee (a +18 net approval rating in D+13 Washington). But others have brands that distinguish them from their parties and make them way more popular (or unpopular) than partisanship alone would predict. We can quantify each governor’s “Popularity Above Replacement Governor” (or PARG) by measuring the distance between their net approval rating and their state’s partisan lean. By this measurement, Scott is still doing pretty well. He’s 31 points more popular than a generic Republican “should” be in Vermont, good for the seventh-highest score in the country. Note: A Democratic governor with a net approval of +2 in an R+7 state has a PARG of +9 (2+7 = 9). If the same state had a Republican governor with the same approval rating, the PARG would be -5 (2-7= -5). Alaska’s Bill Walker was omitted from this list because he’s an independent. *A state’s partisan lean is the average difference between how the district voted and how the country voted overall in the last two presidential elections, with 2016 weighted 75 percent and 2012 weighted 25 percent. It’s not surprising that the two governors with the highest PARG are also the two most popular governors overall. Think about it: If a governor appeals only to their own party, there’s a ceiling on how popular they can become. (Even the most lopsided state in the 2016 election, Wyoming, gave only 68 percent of its votes to President Trump.) To break through that barrier, you need to have crossover appeal. When you’re a Republican in a dark-red state, there’s no real incentive to build on that base — you’re going to win your next election anyway. But Republicans in blue states (and Democrats in red states) are forced to win over voters on the other side. Otherwise, they can’t get elected. As long as those voters continue to approve of their actions in office, the sky’s the limit for these governors’ approval ratings. An NBC News/Marist poll that was making the rounds Wednesday included some stunning numbers from a trio of Midwestern states. When asked whether Trump deserves re-election, Michigan voters said 62 percent to 28 percent that someone else should be given a chance. Minnesota voters agreed 60 percent to 30 percent, as did Wisconsin voters, 63 percent to 31 percent. The problem, though, with these types of polls is that a presidential election is a choice, not a referendum. It’s easy for voters to hear a question like that and measure up Trump against their ideal candidate. But the Democrats’ 2020 nominee won’t be every voter’s ideal candidate, and Trump won’t lose these states by 30-plus points, either. Americans are split on Trump’s Supreme Court nominee, Brett Kavanaugh. According to a Quinnipiac poll, 40 percent of voters said the Senate should confirm him, while 41 percent said it should not. Eighty percent of Republicans but only 11 percent of Democrats said Kavanaugh should be confirmed. 33 percent of Americans approve of Trump’s handling of his summit with Russian President Vladimir Putin in Helsinki this month, according to an ABC/Washington Post poll; 50 percent disapprove. That’s in line with the Quinnipiac poll, which found 27 percent said the summit was a success, while 52 percent said it was a failure. 33 percent of Americans said they think the FBI is “biased against the Trump administration,” as opposed to “just trying to do their job,” according to a Marist poll. That’s up from 23 percent in February. 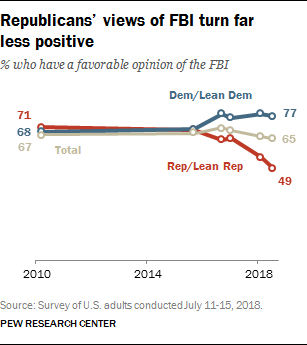 A poll from the Pew Research Center found a decline in the FBI’s favorability from 71 percent in September 2016 to 65 percent now. That may not seem like much of a change, but the topline numbers mask a growing partisan divide. A Monmouth University poll shows that Democrat Conor Lamb has a double-digit lead on Republican Keith Rothfus in Pennsylvania’s 17th District. The district was newly drawn from bits of other districts by the Pennsylvania Supreme Court, making this the only House race that pits incumbents against each other. A YouGov poll found that 49 percent of Americans said they believe it is either “definitely” or “probably” true that millions of illegal votes were cast in the 2016 presidential election. That includes 42 percent of Democrats as well as 59 percent of Republicans. In addition to the governors survey, Morning Consult also released job approval numbers for every member of the Senate. Vermont’s Bernie Sanders had the highest approval rating, while Kentucky’s Mitch McConnell had the highest disapproval rating. 70 percent of Americans said in a YouGov poll that, of the five senses, they would miss sight the most if they lost it; 7 percent said they would miss hearing the most, 5 percent said taste, 3 percent said touch, and 2 percent said smell. This week, Trump’s net approval rating sits at -11.7 percentage points, according to our tracker: 41.3 percent approve of his job performance and 53 percent disapprove. 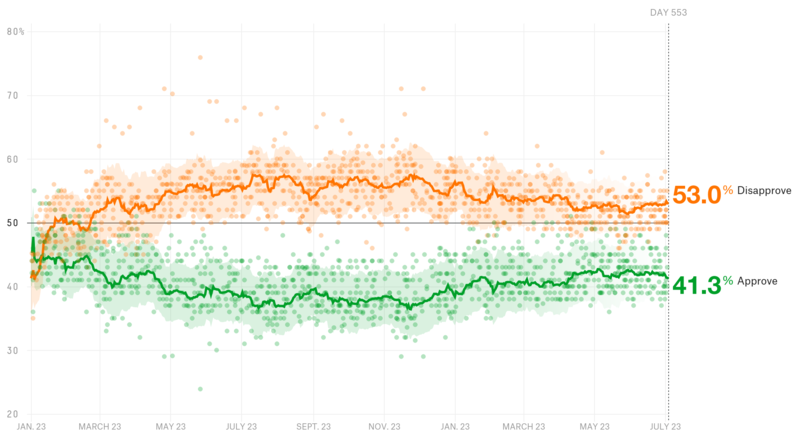 Last week, the spread was a bit smaller, at -11.0 points (a 41.8 percent approval rating compared with a 52.8 percent disapproval rating). He was slightly more popular a month ago, when his net approval rating was -9.5 points. Back then, 42.2 percent approved and 51.7 percent disapproved of his performance. According to FiveThirtyEight’s model of generic congressional ballot polling, 48.1 percent of voters prefer Democrats and 39.9 percent prefer Republicans. 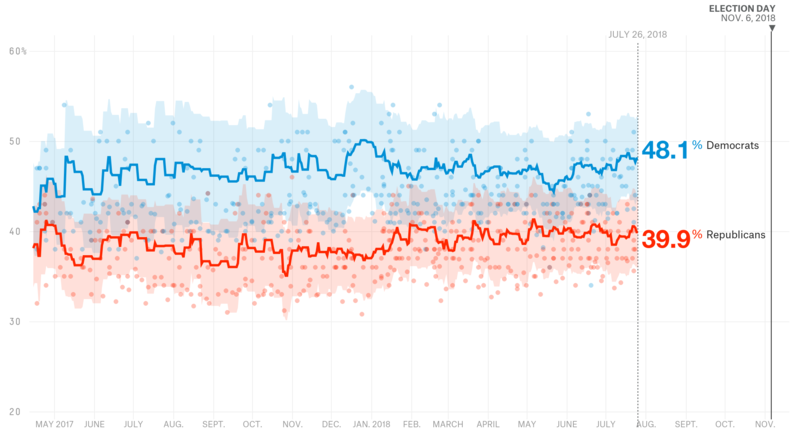 That 8.2-point margin has reverted to the mean a bit from Democrats’ unusually wide 9.3-point lead (Democrats 48.7 percent, Republicans 39.4 percent) last week, but it’s definitely much better for them than the 5.7-point lead (Democrats 46.4 percent, Republicans 40.7 percent) they held this time last month. Check out all the polls we’ve been collecting ahead of the 2018 midterms. In third was Kay Ivey, the Republican governor of Alabama. The average difference between how a state or district voted in the past two presidential elections and how the country voted overall, with 2016 results weighted 75 percent and 2012 results weighted 25 percent.